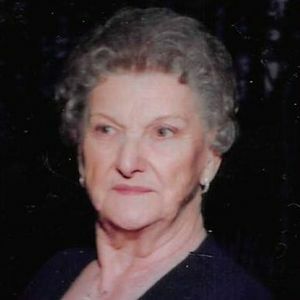 Lucille I. Lessard, 96, of Manchester died April 7, 2019 at Community Hospice House, Merrimack, surrounded by her loving family. Born in St. Catherine, Canada on September 18, 1922, she was the daughter of Rodolpha and Cordelia (Gaudreault) Bernard. Lucille was educated in Canada and moved to Manchester, NH in 1950. She worked for Evangline, and Dorson Fleisher Shoe for nearly 40 years before retiring in 1988. She was lovingly known by most everyone simply as 'Memere'. She loved her gin and tonics, knitting, taking walks, playing cards and was always ready to go out with anyone that asked. Spending time with her family and friends made her happiest. Lucille loved to laugh and was a very funny and happy lady. Above all, she will be remembered as a loving wife, mother, Memere, big Memere, sister, aunt, and friend. Lucille was predeceased by her husband of 54 years, Alfred G. Lessard in 1991. The family includes one son, Jacques Lessard of Manchester; two granddaughters, Stephanie Lessard of Manchester, and Natalie Girouard and husband Michael of Rochester; three great grandchildren, Lucy, Willow, and Hope; and many nieces and nephews. She was also predeceased by three brothers and one sister. A Mass of Christian Burial was celebrated on Friday, April 12, 2019 at Ste. Marie Church, 378 Notre Dame Ave., Manchester, NH. Committal prayers followed at Mt. Calvary Cemetery, 474 Goffstown Rd., Manchester. In lieu of flowers, donations in Lucille's memory may be made to: The Birthday Treasure Chest at Ste. Marie Parish, 133 Wayne St., Manchester, NH 03102. Add your thoughts, prayers or a condolence to Lucille I. 's guestbook.